Divide the family into two teams and give each team a flag – it can be anything of your choosing (even a piece of fabric). Split up your yard into two equal boxes: one box for one team and another box for the other team. Place a flag at the back line of each box and line up the players of each team on their respective flag line. Once the game starts, the players sprint to the other side and try to gather the other team’s flag to take back to their flag line. If any player is tagged in opposing territory, he’s out and must stand behind the other team’s flag line. If he brings the flag back to his home flag line, he is safe and scores a point. The team that scores 3 points first wins. Flag football has been a P.E. class favorite for a long time. Why not bring it to your backyard? The rules are similar to regular football except each player has 2 foot long flags suspended from a removable belt or tucked into their shorts. The tugging off of a flag resembles the typical football tackle. So, if a player were to have his flag taken, the player is therefore “tackled.” If you want a safer way to play football, flag football is the best alternative. Invite the whole neighborhood over and get playing! Get out your bikes and explore your neighborhood the old fashioned way. If you live in a suburban neighborhood, bike around with your kids and see all the things that you might have missed while driving. 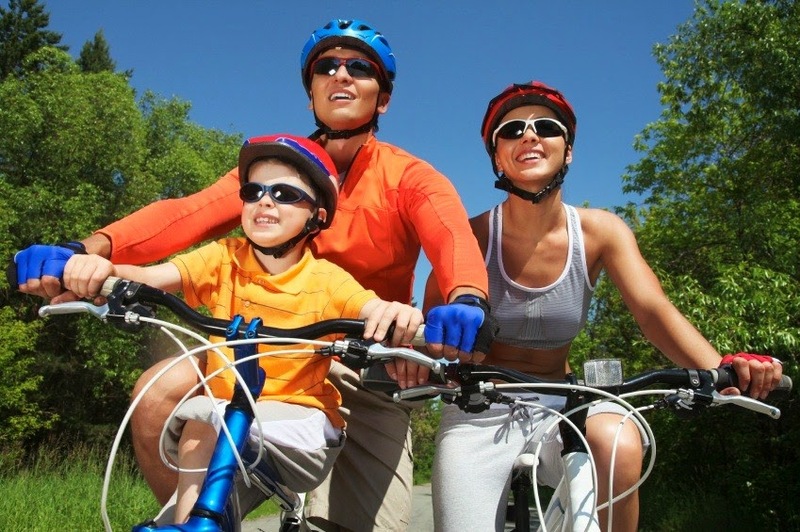 If you’re neighborhood isn’t the safest place for kids to bike, check out local nature trails or biking trails. Not only will this be a great bonding experience for your family, it will also help your kids get some necessary outside time. Tell your kids to bring a friend for added incentive to get outside! If you have a basketball hoop or a neighborhood basketball court, why not take the kids over to play a good-old fashioned game of H.O.R.S.E? Decide on the order of the players: who goes first, who goes second, etc. The first player attempts a shot at the hoop from any position and any style. If the first player makes the shot, the player that follows the first player then has to mimic exactly how the first player made the shot. If the second player is not able to make the shot the same way the first player did, they get the letter “H”. If player 2 makes the shot, the third player has to attempt to make the same shot the first player made. If player 3 fails to make the shot, they get the letter “H”. Whoever makes it to HORSE first, loses the game. Geocaching uses GPS units to find hidden treasure in your neighborhoods, common parks, or nature trails. There’s also an app for your phone! If your kids love to treasure hunt, then they will love geocaching. Dress your kids for the outdoors and bring along water, snacks, a pen and a few assorted trinkets (think playing cards, figurines, etc). Input the basic coordinates of the cache and try to find it with your kids! Once you find the cache, there should be a few small items around it. If you decide to take something from the cache (for memories! ), then you must replace the item with one of your little trinkets. There might also be a logbook at the cache site. If so, use your handy pen to sign the guest log! The geocaching website also lists family-friendly and kid-friendly caches. family outdoor activities! For information on sports and injuries, check out MMAR Medical.